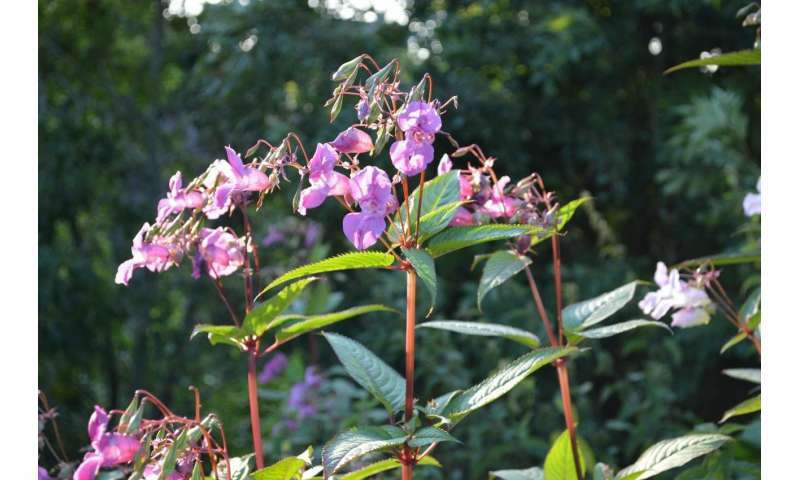 The University of Stirling study provides clues as to why the abundance of Himalayan balsam—which has an adverse impact on native plants and river habitats—varies dramatically from place to place. The work could help mitigate the impact of the pink-flowered plant, which outcompetes native species, causes shading and reduces the stability of riverbanks, enabling silt to enter the water. Dr. Zarah Pattison, of the Faculty of Natural Sciences, led the research, published in Ecosystems. She said: "Our research has found that Himalayan balsam dislikes overly moist conditions, unlike the native plants—such as nettles, butterbur and canary grass—which dominate our lowland riverbanks. It prefers drier, steeper riverbanks where it can compete more effectively with the native plants. "This knowledge offers a gateway to managing Himalayan balsam indirectly, by manipulating conditions on riverbanks." River engineering often involves straightening and over-deepening rivers and, combined with the abstraction of water, this leads to drier riverbanks during the summer, benefitting Himalayan balsam growth. This effect of riverbank drying may also be exacerbated with future climate change and drought conditions, as seen this summer across the UK. In contrast, the restoration of rivers often results in gently sloped banks, meaning water is retained and riverbanks are therefore moister, favouring native species. 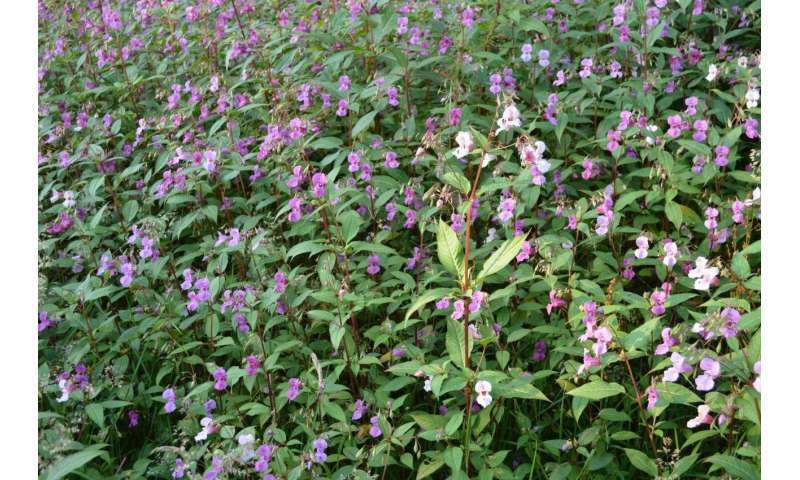 The authors also found that riverbanks with a large abundance of native plants are more likely to resist invasion by Himalayan balsam. Dr. Pattison believes the findings will aid river management by helping to pinpoint resources in attempt to control Himalayan balsam. "The UK spends an estimated £1.7 million on managing invasive alien species, including thousands of man-hours manually removing or spraying species such as Himalayan balsam," she said. "Therefore, understanding the conditions which benefit the growth and spread of this species will enable better management and use of resources, in order to control the amount and spread of Himalayan balsam." The research involved field surveys conducted along 20 rivers across the Central Belt of Scotland. The team used a technique, structural equation modelling, to assess the data and understand the effects of the environment and resident plant community on the abundance of Himalayan balsam.